The government is deliberately misusing evidence and statistics to misrepresent the plight of the poor, a report says. The Methodist and United Reformed Churches, the Church of Scotland and the Baptist Union jointly published the The Lies We Tell Ourselves study. 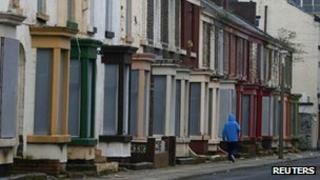 Researchers said evidence had been skewed to put the blame for poverty at the door of the poor themselves. The government said it had always made it clear that the system was failing people, not the other way around. The churches said that a number of "myths" about welfare claimants have arisen as a result of statistics being misused. These are repeated by the media and find their way into the popular consciousness. The myths, according to the churches, pin the blame for poverty directly on those who rely on welfare benefits while ignoring more complex reasons. These incorrect ideas must be challenged, according to Paul Morrison from the Methodist Church. He said: "Everybody is complicit - politicians, the media and the general public. "This is because we have a culture which allows us to tell lies in public life." Mr Morrison said many people preferred to believe that bad things only happen to "bad people". The report challenged what it called several misleading ideas about welfare and poverty. One of these related to the 2011 launch of the government's plan to tackle disruptive families, the Troubled Families programme. Speaking about the programme at the time, Prime Minister David Cameron referred to 120,000 families who were plagued by drug addiction, alcohol dependency and crime. The report said families counted as "troubled" had to exhibit certain characteristics - none of which actually related to alcohol or drug addiction or criminality. The largest shared characteristic of the families was, in fact, that the mother had mental health problems. The report's authors also challenged the idea, repeated by Work and Pensions Secretary Iain Duncan-Smith, that in some parts of Britain there are three generations of families where nobody has ever worked. According to Mr Morrison, the Department for Work and Pensions (DWP) has admitted that no data exists to prove this claim. In response to the report, the DWP said there was an ongoing debate about the benefits system. The department's reforms aimed to end the benefits trap and make it easier for those who needed help to get it. The four churches said they would send a copy of their findings to every MP and MSP. They have called for an honest debate about poverty, with policy being formed on the basis of clear facts.